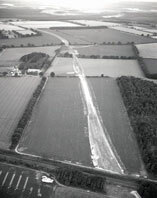 The Norfolk Air Photo Library (NAPL) was founded in 1974 and is maintained by the Norfolk Historic Environment Team. It currently contains over 85,000 vertical and oblique images of Norfolk taken between 1915 and the present day and has become one of the most significant local collections in the country. The NAPL collections reflect the county’s long-standing connection to aerial photography, containing early images taken by the Royal Flying Corp between 1915 and 1919, photographs by H. Frederick Low of the Norfolk and Norwich Aero Club (founded at Mousehold Aerodrome in 1930) taken between 1931 and 1939, and aerial images taken by Norwich photographers George Edwin Swain and George Swain Junior between 1920 and 1958. The legacy of these early pioneers has been continued by individuals such as Derek A. Edwards, founding officer of the NAPL, and freelance photographer Mike Page, who has made significant contributions to the NAPL collections in recent years. 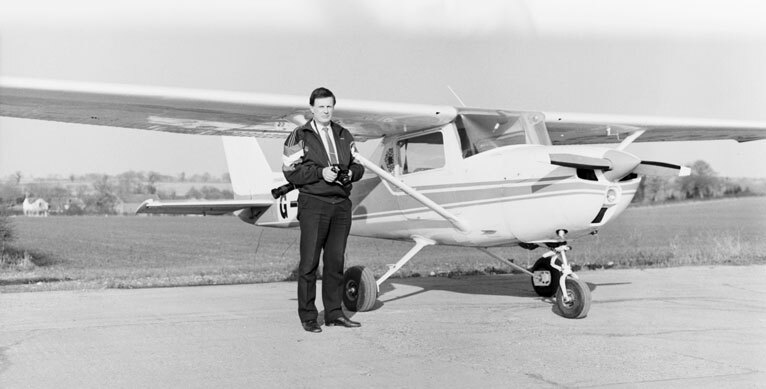 Derek Edwards, founder of the Norfolk Air Photo Library. The core of the NAPL oblique image collection is formed of over 40,000 specialist images of archaeological sites and historic buildings taken by Derek A. Edwards between 1974 and 2000. These images focus on cropmarks, earthworks, and historic buildings throughout the county and provide an important record of Norfolk’s Heritage. Approximately 1000 of these oblique images focus on archaeological sites in the Breaking New Ground scheme area, including Grimes Graves Neolithic flint mine, cropmarks of Bronze Age barrows and Roman settlements, historic parklands, and the growth of Thetford. The BNG project has provided us with the opportunity to digitise these images and make them available outside of our offices for the first time. The catalogue is organized by parish, and jpeg images are available by request, free of charge. Please download our image request form and include a list of the reference numbers for the images. Please e-mail the completed form to heritage@norfolk.gov.uk. Additional details about the Norfolk Air Photo Library, including access to the collections, please contact the Norfolk Historic Environment Record staff.